Star Wars (20th Century Fox, 1977). One Sheet (27" X 41"). Happy Birthday Style Ultra Rare. This is a guaranteed original movie poster. This is not a REPRINT or a REPRODUCTION. A year after its original release. Was still running strong in theaters across the U. To celebrate this milestone, these theaters were presented with this special one sheet. Though technically designated "Style E", it is known by collectors the world over as the "Happy Birthday" poster. It was photographed by Weldon Anderson and designed by Tony Seiniger using the 11 of the 12 original Kenner action figures (the Jawa was omitted). The print run of these posters is believed to have been fewer than 500 sheets, with even fewer being in good enough condition to use due to a printing error, making this survivor a rare find indeed. This poster is in C8 Excellent condition. The photo above is of the actual item you will receive. This poster has signs of edge wear, fold line wear, creases, some surface paper scuffs, small points of color loss scattered throughout the black background, etc. This poster appears to have been rolled at one time and then slightly pressed which left a continuing set of creases down the left side. This poster will look absolutely amazing after very minor restoration and linen backing. These do not come up for sale very often so don't miss out!! 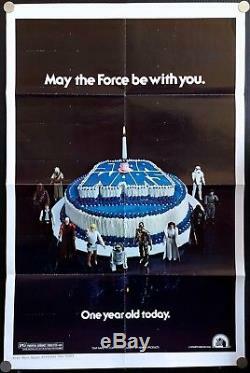 The item "Star Wars Original Movie Poster Happy Birthday Style (27x41) Ultra Rare C8 EX" is in sale since Monday, November 26, 2018. This item is in the category "Entertainment Memorabilia\Movie Memorabilia\Posters\Originals-United States\1970-79".